Orakelkortlek på engelska med 52 kort och instruktionsbok. Through lush, Victorian-influenced images, the Oracle of Visions deck offers unique perspectives for insightful and intuitive readings. Rather than relying on a single theme, this eclectic oracle deck introduces archetypal figures from many areas of life, including the theater and the carnival. Ciro Marchetti’s imaginative scenes encourage us to set aside pre-conceived ideas and open ourselves up to new ways of looking at our choices, decisions, and potential outcomes. Oracle of Visions set includes 52 cards and 140-page illustrated guidebook. 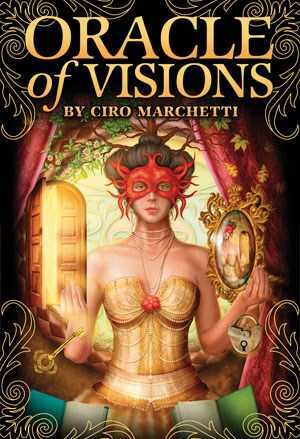 Following a career in advertising and graphic design, Ciro Marchetti has devoted the last decade of his life to the creation of several divination decks, including the Gilded Reverie Lenormand deck and the Tarot of Dreams. His award-winning digital artwork is popular around the world.